As promised, we will burn the remaining tokens that have not been claimed by airdrop participants. The remaining tokens left can be found in the official airdrop wallet. The total number of TDP tokens that will be burned is 1,628,065 TDP. At the time, when TDP token smart-contract was deployed, there was no intention of incorporating “Burn feature” in the token itself. But after airdrop allocation, a large number of tokens have left from being claimed. It is necessary that all remaining tokens from airdrop allocations should be burnt. The smart-contract can be upgraded with “Burn feature” and redeployed on Ethereum network. But the complete migration process will be time-consuming and would cost a lot of funds that are reserved for development purposes. The tokens can also not be sent to 0x0 address due to an assertion of 0x0 address in the transfer method of smart-contract. The best way for burning tokens is to design a burn method in the smart-contract itself that can modify the total supply of tokens. But this cannot be done due to the reasons explained in “The problem” section. As per the above references, TrueDeck team has developed their own implementation which can be found here on GitHub. It also contains the deployment on Ethereum Ropsten Testnet for testing purposes. In order to ensure secured burn of TDP tokens, the team has defined a robust plan. The burn process will be carried out in multiple stages with bounty programs. In each stage, a certain amount of TDP tokens will be allocated to the smart-contract and the smart-contract will then be destroyed. Each stage will have a certain duration, during which a bounty program will be held to challenge hunters to steal the tokens from the destroyed smart-contract. The locked tokens will be the bounty reward if the hunter is successful to steal the tokens. The amount of tokens to be burned is very huge, that is the reason we are taking the utmost care and proper time for testing before carrying out the process. We need community support to implement this in a secure and efficient way. 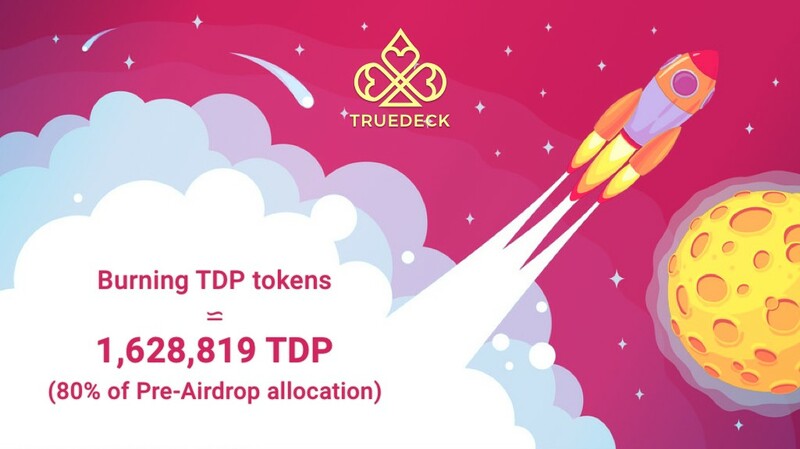 TrueDeck is a decentralized blockchain casino platform that will enable casinos to leverage the advantages blockchain technology offers. The company’s mission is to create robust but simple technologies which leverage Smart-Contracts and Blockchain to provide a truly transparent and cryptographically secured casino experience. #1 Blockchain based Casino Platform | Building the technology today for the casinos of tomorrow.